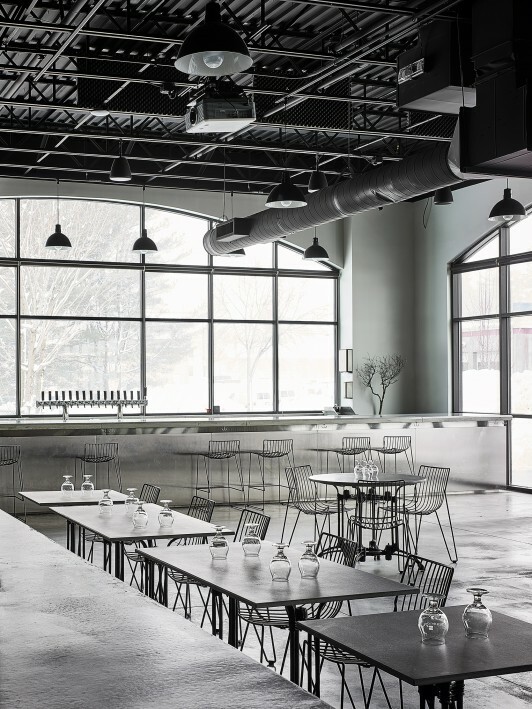 An industrial minimalistic brewpub in the heart of New Hampshire. 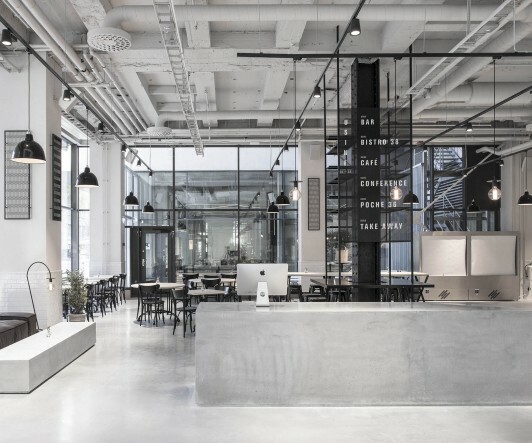 The already existing industrial building came with elements like concrete flooring, a black industrial ceiling and windows with black steel frames. 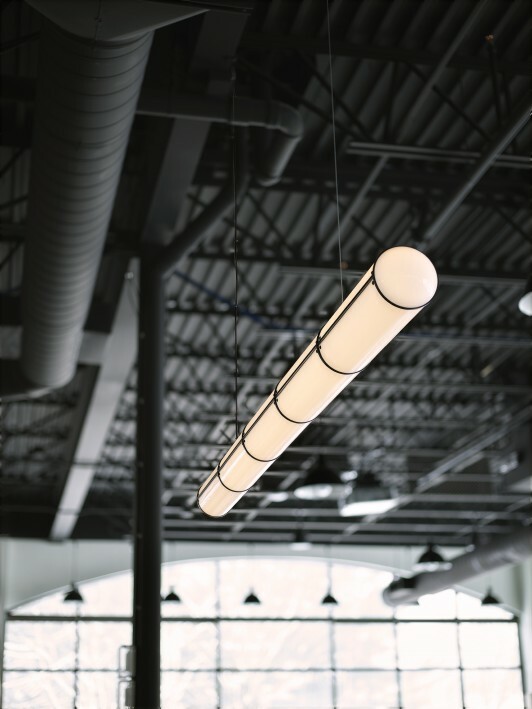 I wanted to build around the original details only adding a few other materials to accentuate and compliment the simple and industrial feeling of the space. This meant that I needed to be creative in what materials to use and how to use them. 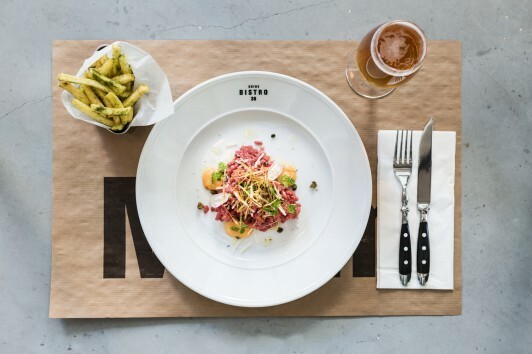 The goal was to create a framework where the beer together with the fresh food and the people interacting would be the main event. 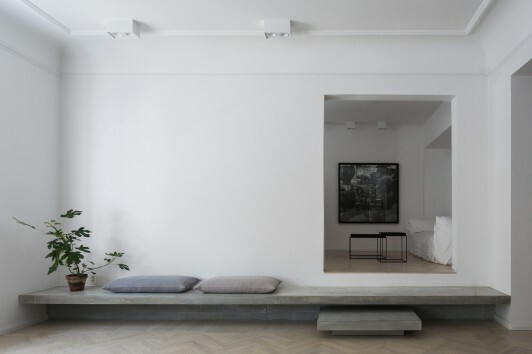 A minimalistic living room where everyone is mingled together. 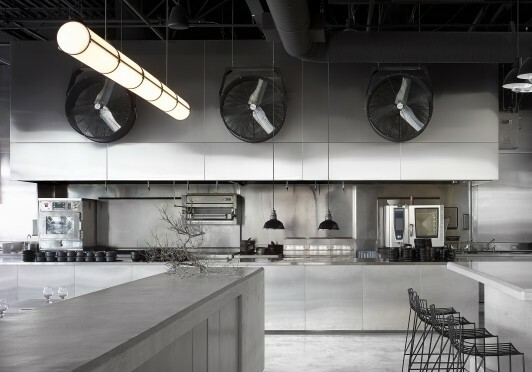 Three industrial fans on the front of the hood connects the black industrial ceiling and chairs, and also useful on hot summer days. 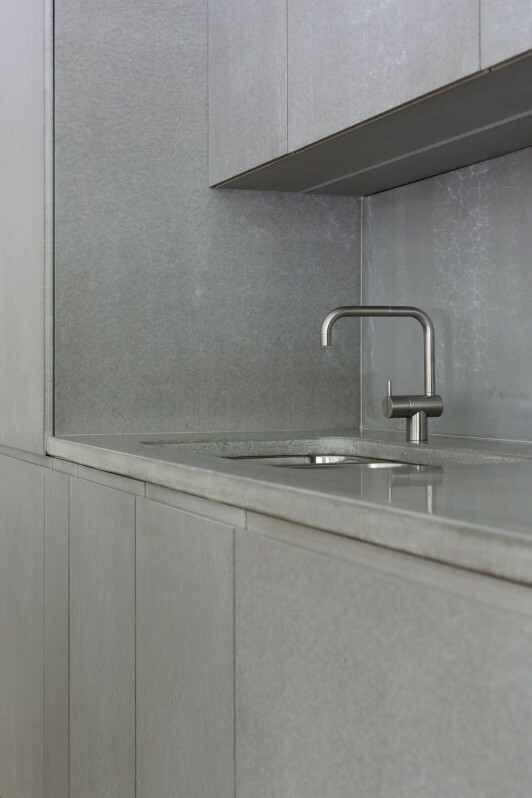 Concrete counter with storage behind light gray Valchromat fronts. 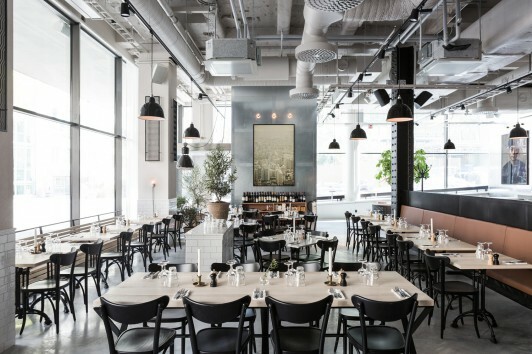 To the right one of the two community tables in concrete measuring 3*1,50 m, bar stools from Swedish company Massproduction matching the dining chairs. 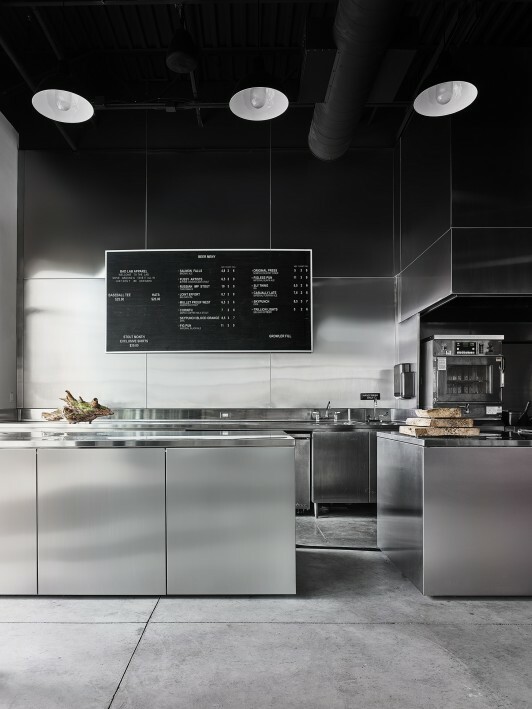 A part of the kitchen that also functions as take away area. 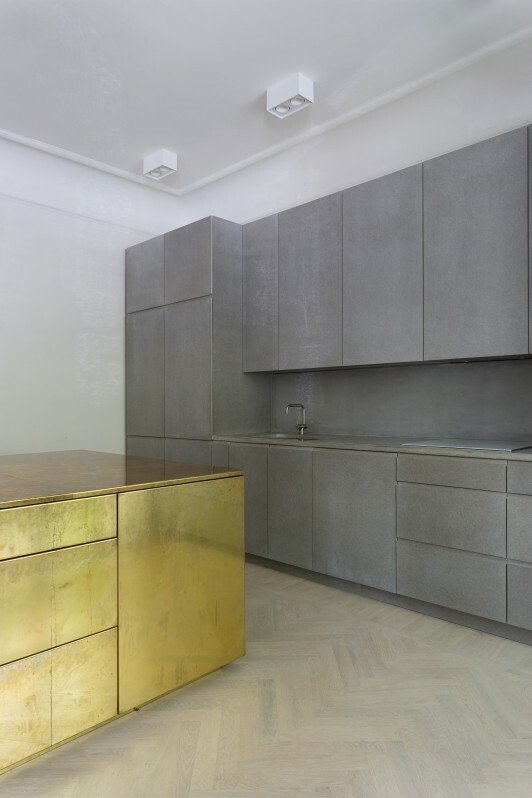 The two stainless steel counters where lifted a few cm from the floor to create a lighter impression. The brewery tanks seen through the glass window. A community table for beer tasting just in front to get a close feeling of the beer production. 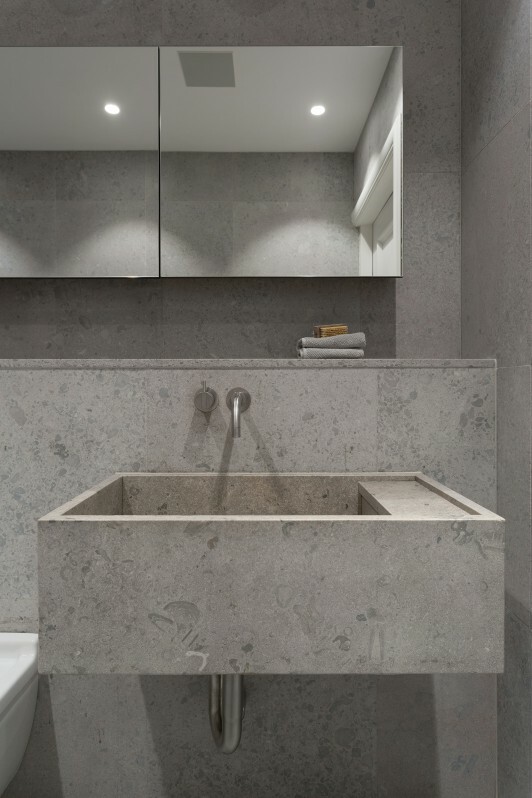 The edges of the concrete counter (seen in front) is made in 45 degrees angle and is lifted a few cm from the floor to create a lighter impression. 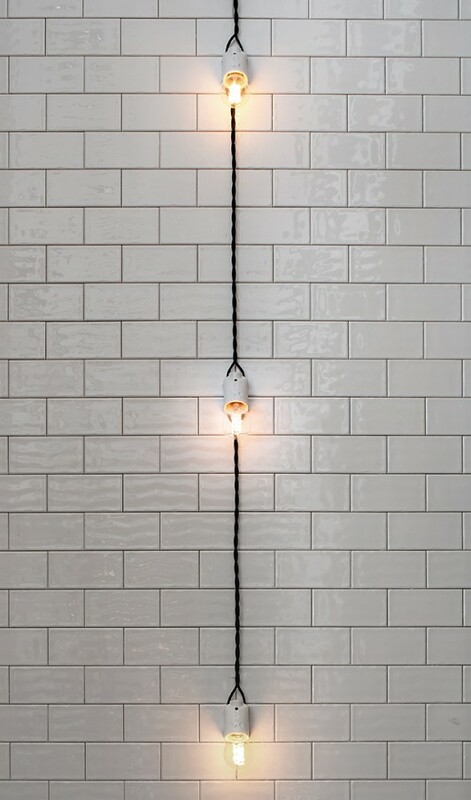 Close up at the pendant lamp from Roll & Hill. 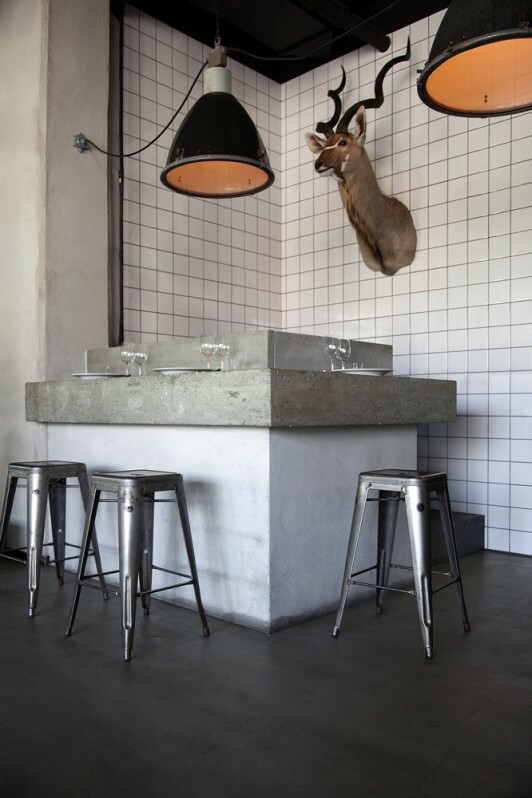 It is placed above the concrete counter and becomes a graphic element matching the lines in the ceiling. Overview of the dining area with the open stainless kitchen in the back. 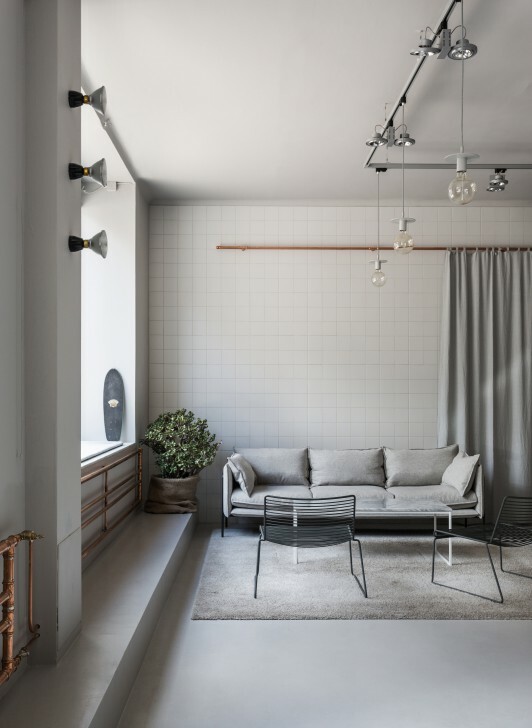 The 10 meter long concrete counter serves as a room divider with a sofa at one side and storage at the other. 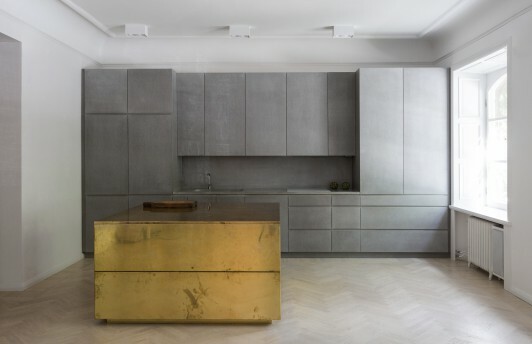 The dark brown leather gives a nice contrast to the otherwise very monochrome space. 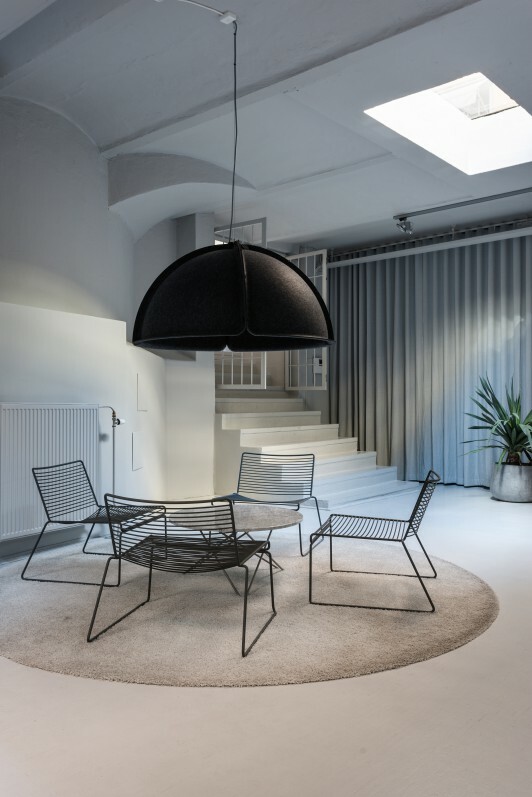 Black chairs from Swedish company Massproduction and table tops in treated light gray Valchromat to match the concrete. 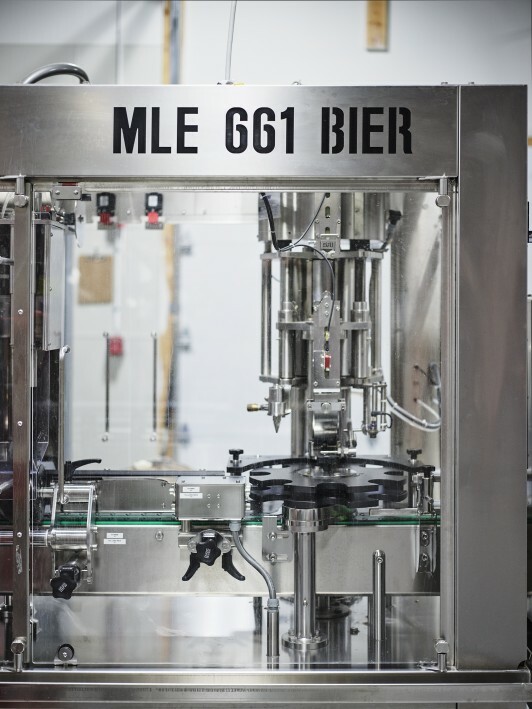 Close up of the brewery equipment in stainless steel. 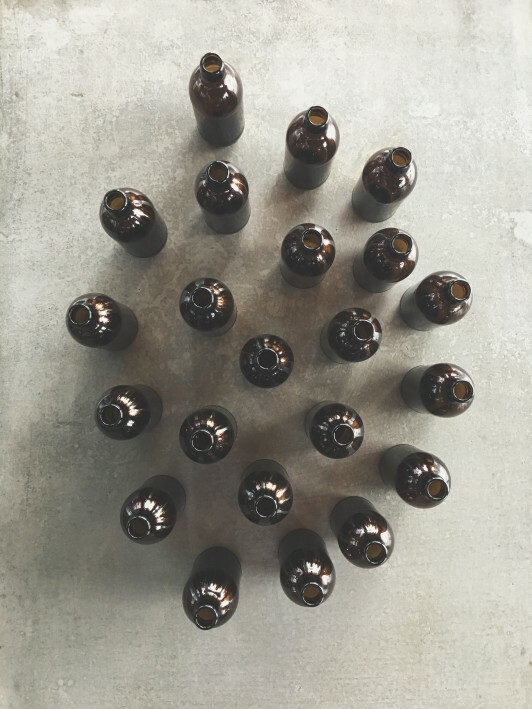 Brown beer bottles in contrast to the concrete. 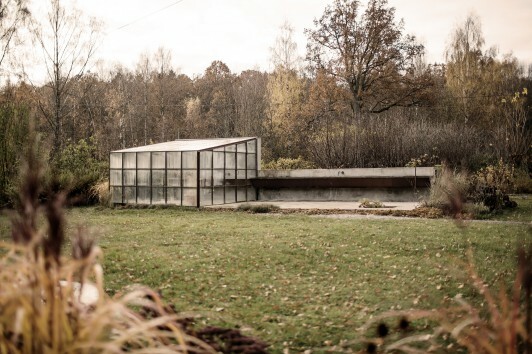 Concrete and corten steel was used to create this Garden house for a private client outside Stockholm. Both these materials ages beautifully. Sinks and faucets were installed. 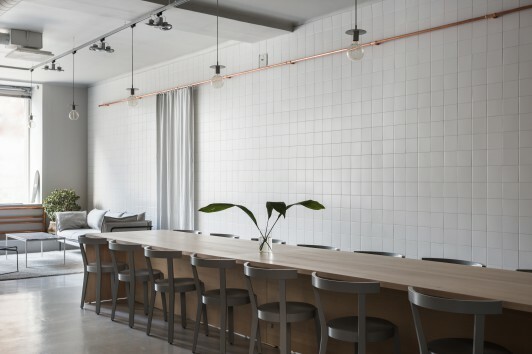 turn an old embassy in Stockholm into a private apartment. 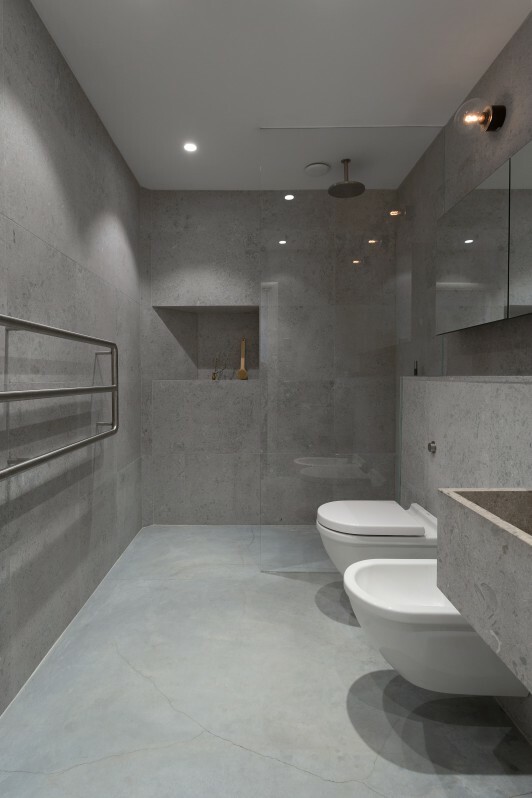 Both bathrooms have concrete flooring and walls covered in blasted limestone from the island of Gotland in the south if Sweden. 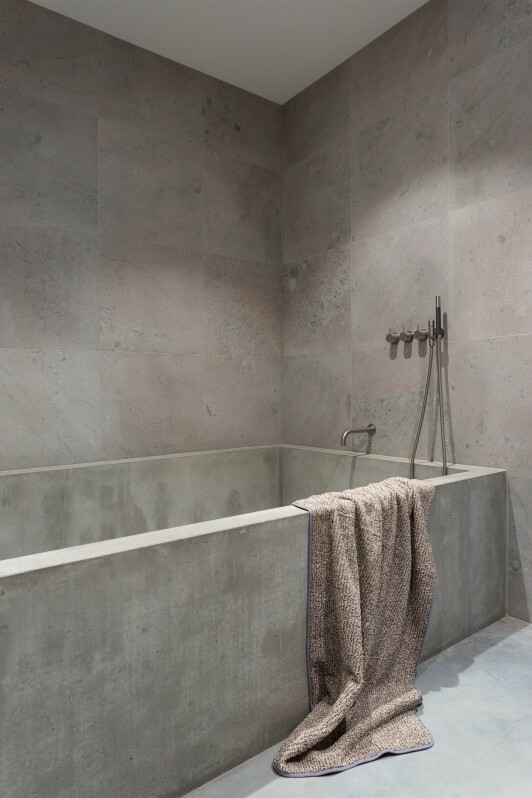 In one of the bathrooms a giant concrete bathtub was built that accommodates the entire family of 5 people. up to the TV room. 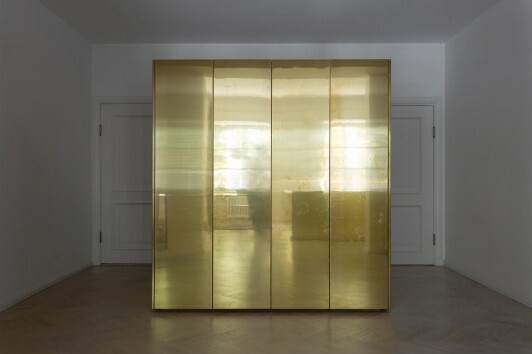 Closet cube covered in brass. walls covered in blasted limestone. 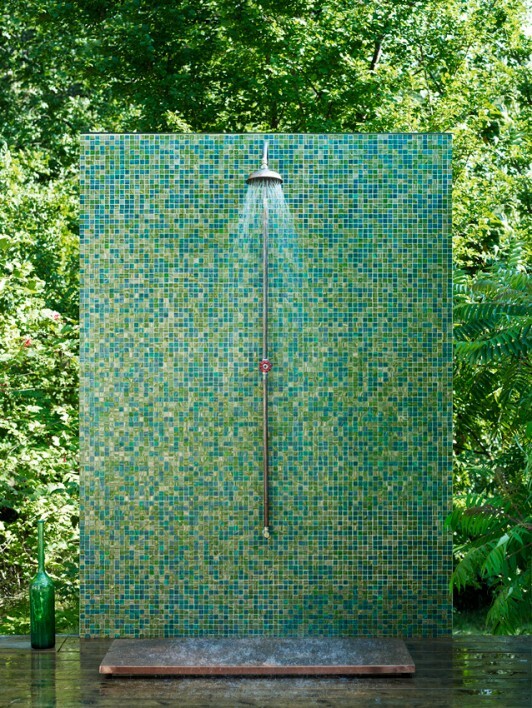 Towel heater made of stainless steel pipes. 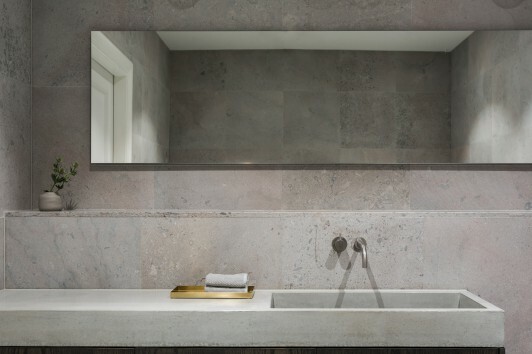 walls and basin in blasted limestone. 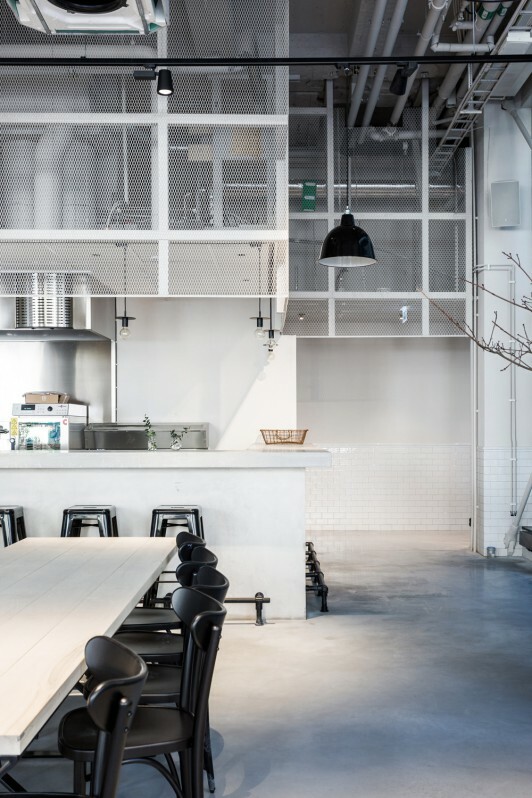 A 2000 square meter former sausage factory in the heart of Stockholm underwent an extensive renovation to give place to the new Usine concept. 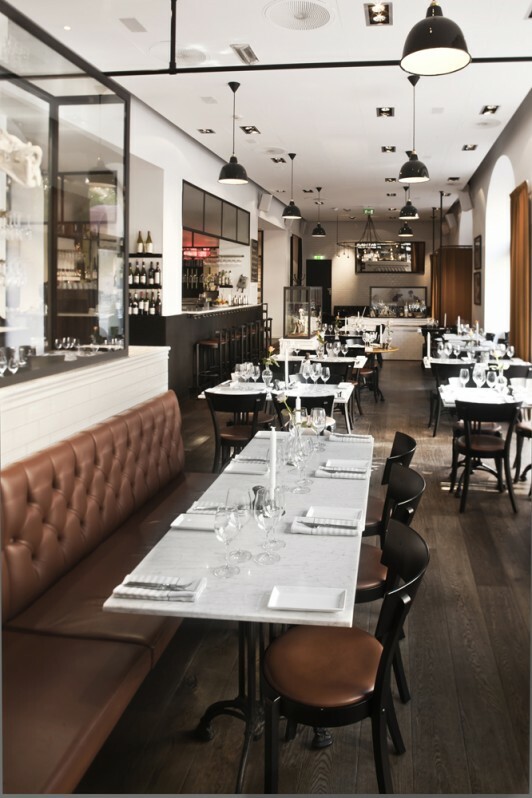 The new space includes Restaurant Bistro 38, Bar Poche 36, café, take-away, reception and conference spaces. 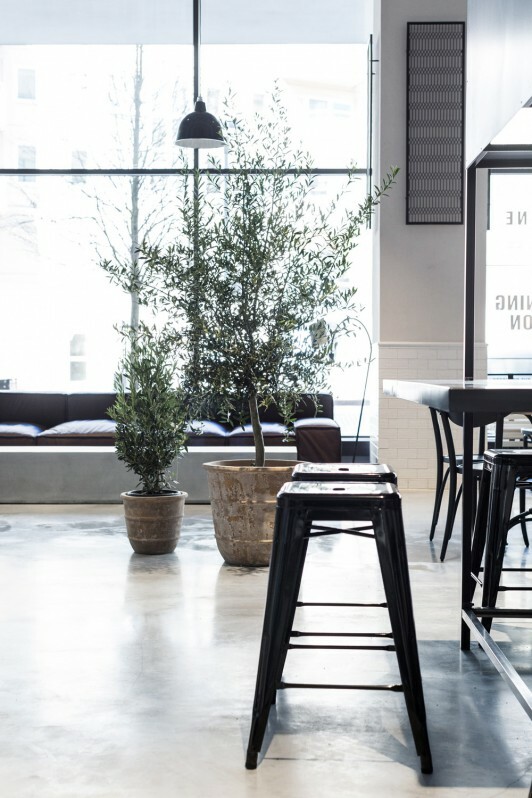 Before the one year long renovations, the premises were used by the Swedish Tax Agency and consisted of a maze of tiny meeting rooms with a ceiling height of 240 cm. The entire bottom floor of the building was completely stripped down. Materials of high quality were selected to last time. 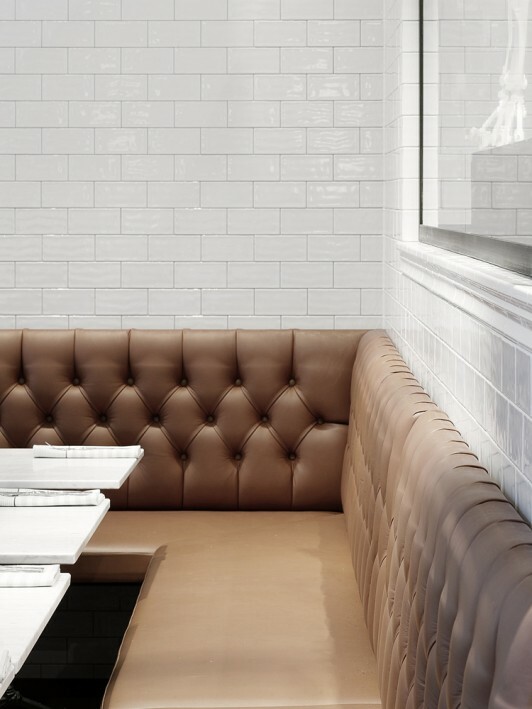 Maple wood custom millwork and cognac leather upholstery accompanied with concrete, galvanized steel, white tiles and black iron details create a stylish but relaxed atmosphere. 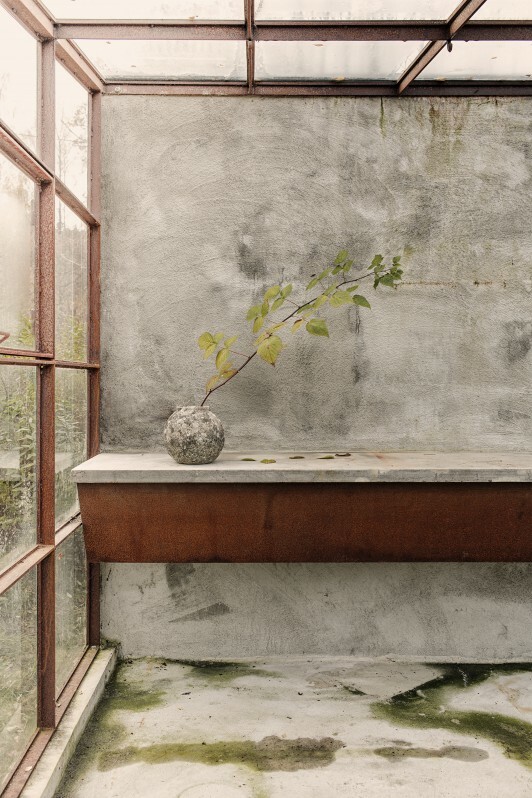 To introduce an accent color, Valcromat in orange and brown was used for table tops, side tables, cabinet doors and menus. 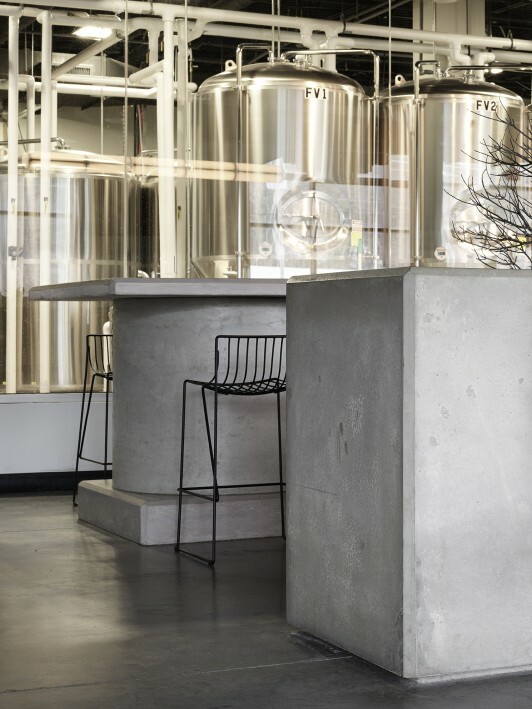 48 tons of concrete was poured into the construction, not only for for the floors, but also to construct the two bars, reception desk, a large sofa table and a 3,5 meter wash basin in the rest room. 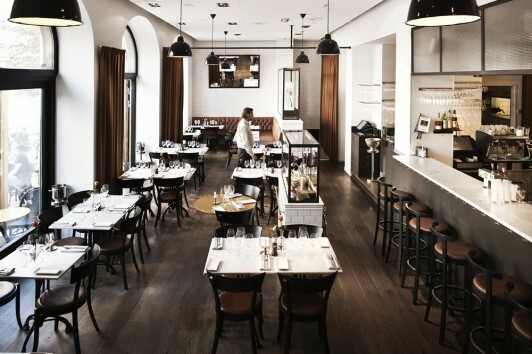 The large space is divided into three rooms, all revolving around a central black iron beam structure that has been designed to serve unique functions. 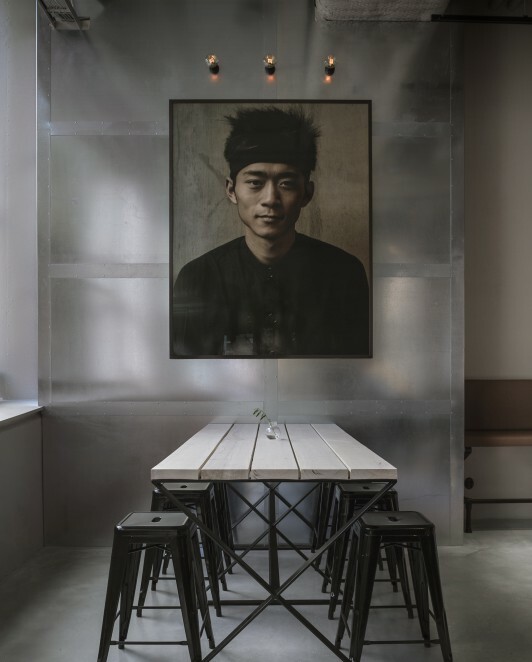 A large photo of a Shanghai chef greets the guests at the entrance, hung against galvanized steel sheets. 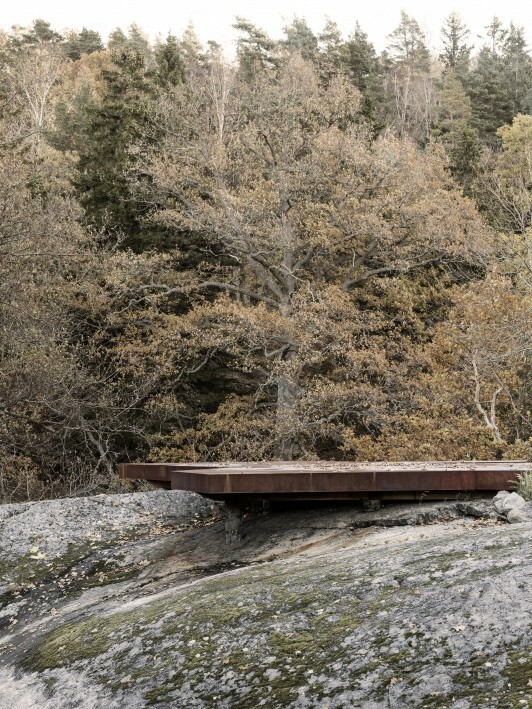 A collaboration between Lindvall and photographer Johan Annerfelt. 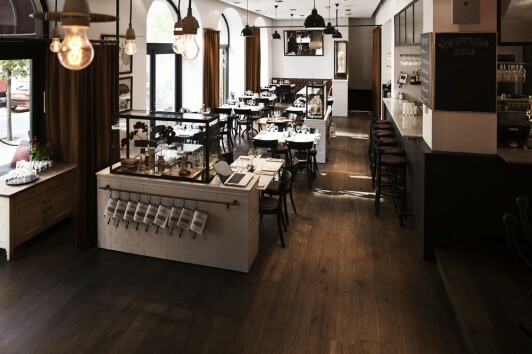 Overview of restaurant Bistro 38, with maple and marble tables, classic bistro chairs and industrial pendant lighting. 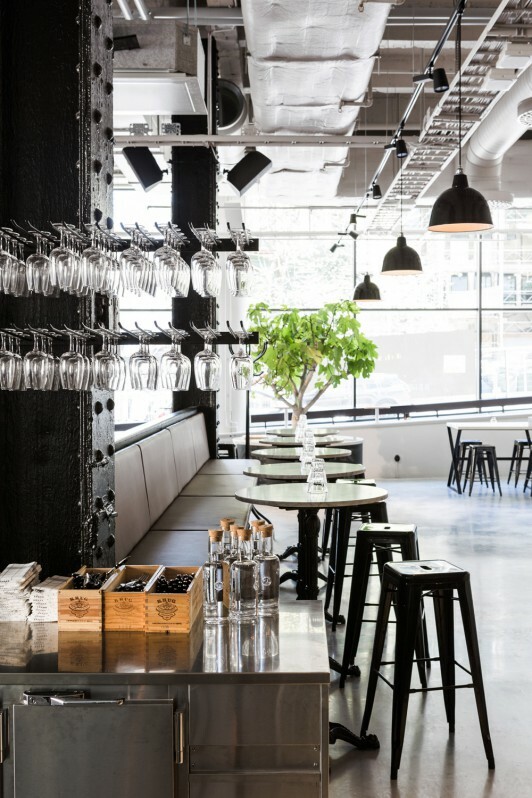 The concrete bar area of Bistro 38 with cast iron foot rest and pendants in black steel. 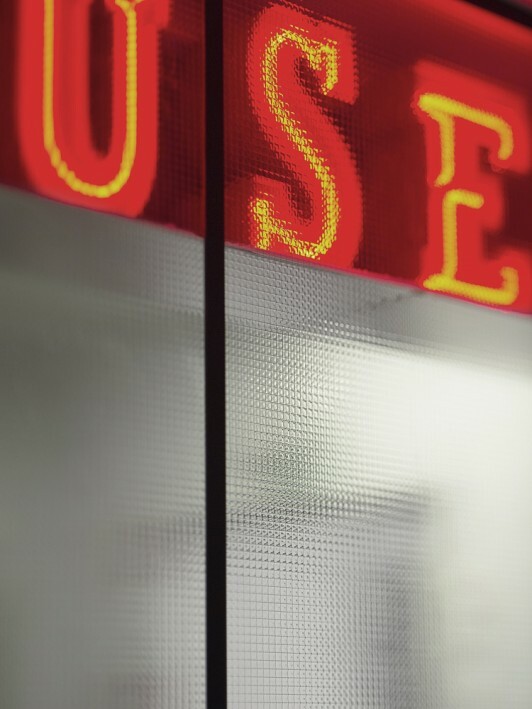 Neon lights are used to emphasize the bar. 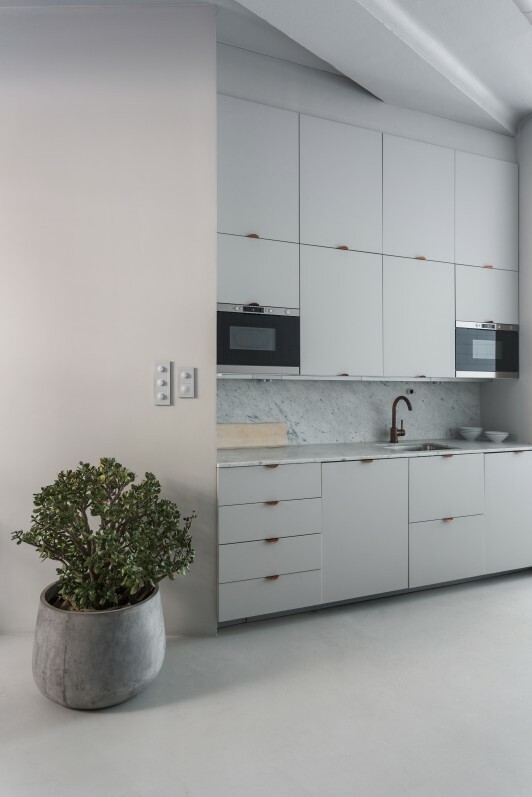 Open kitchen in Poche 36. 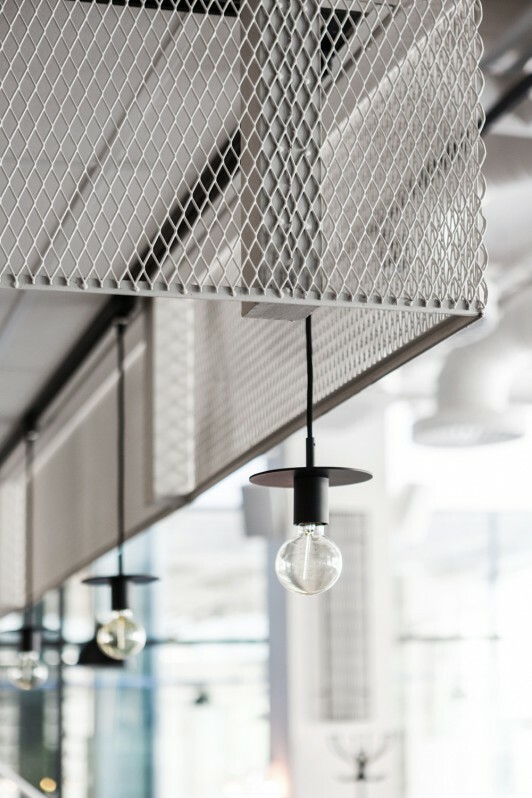 Expanded metal comes down from the ceiling to mark the bar area. 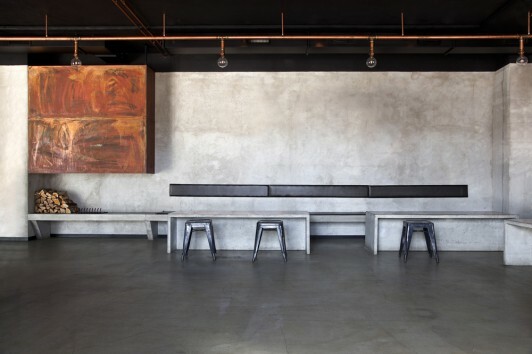 Reception area with 5,5 meter long concrete desk. 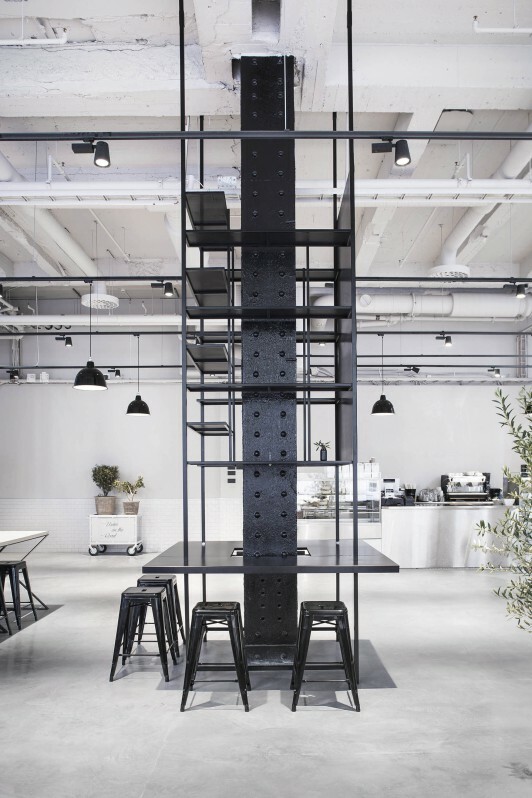 The central beam structure in the café area, surrounded by shelving. 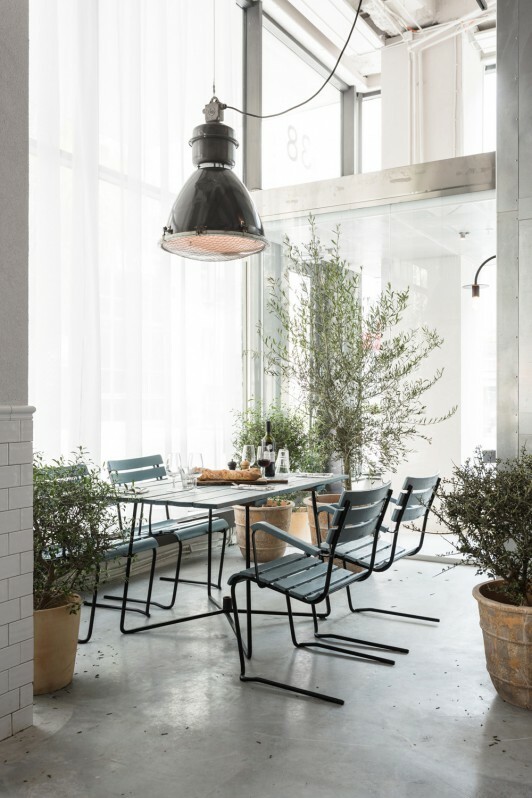 One corner of the restaurant is decorated with an orangery feeling, using old garden furniture, big plants and an industrial pendant light. 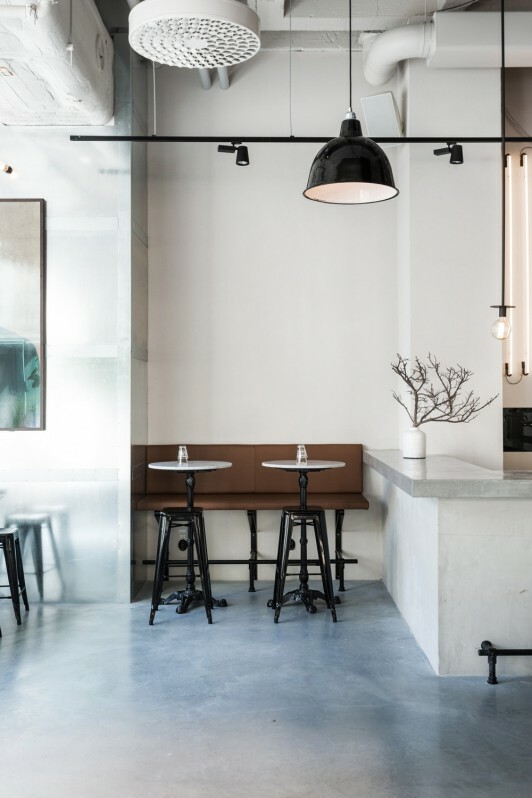 Raised leather sofa designed by Richard Lindvall, black Tolix stools and marble table tops meet the massive concrete bar and floors. 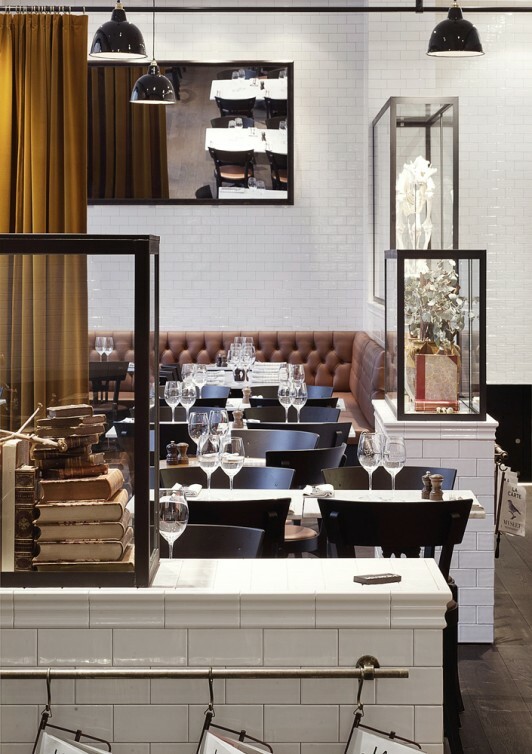 The bar side of the long sofa in the restaurant, with a service station and glass racks in the forefront. 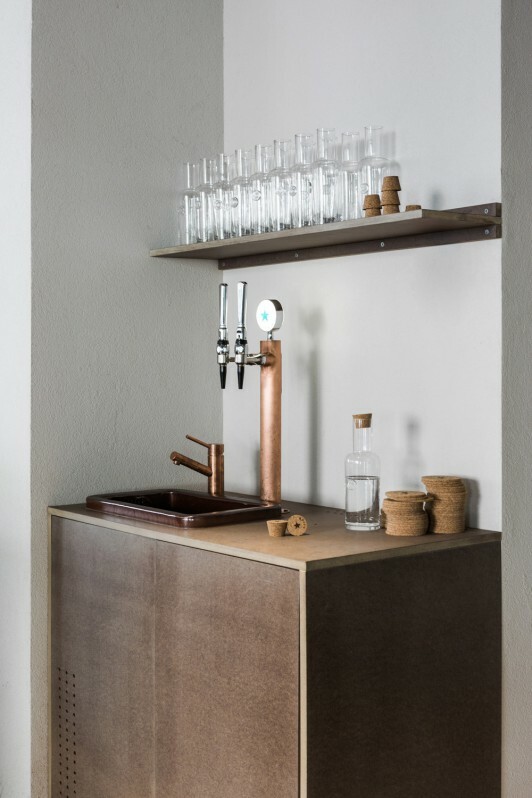 Water station and shelf built from brown Valcromat with a vintage sink. 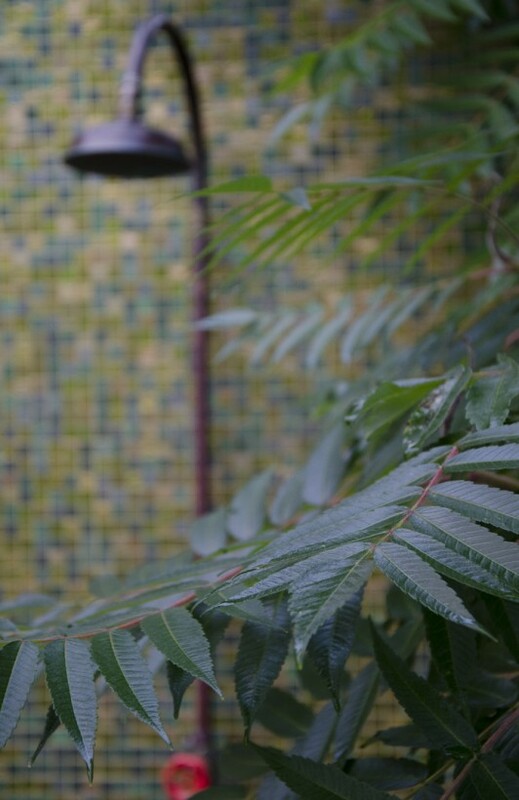 Big olive plants are dotted throughout the space to soften the atmosphere. Bond Street Film is a production studio working across film, animation and interactive. 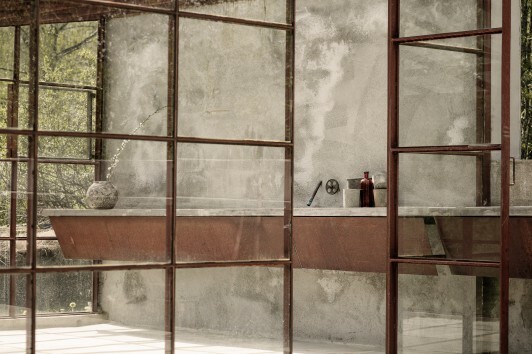 The natural raw atmosphere of the space was kept and used as a base for the concept. 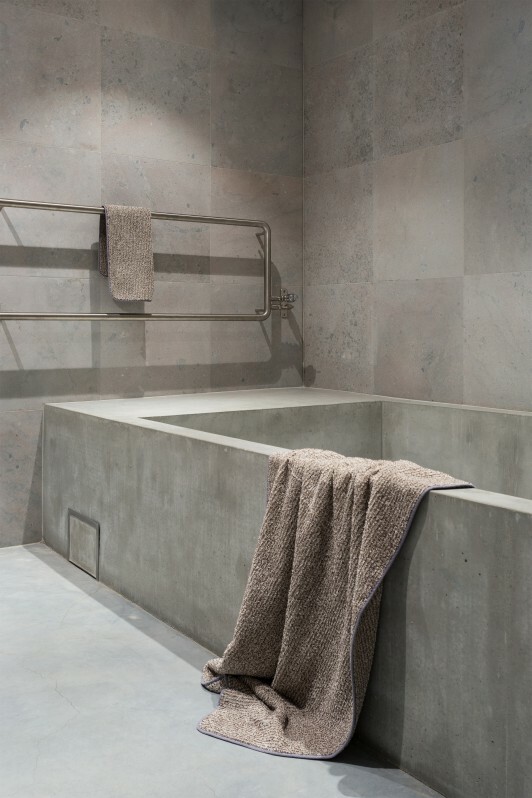 Floors were made of concrete and casted benches were mounted directly onto the walls. 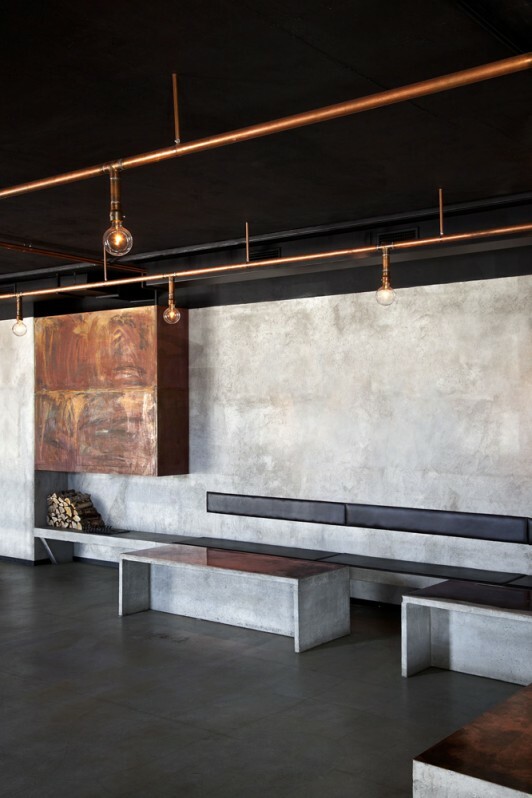 A large fire place in copper and a unique lighting arrangement was custom-made to give warmth to the industrial environment. 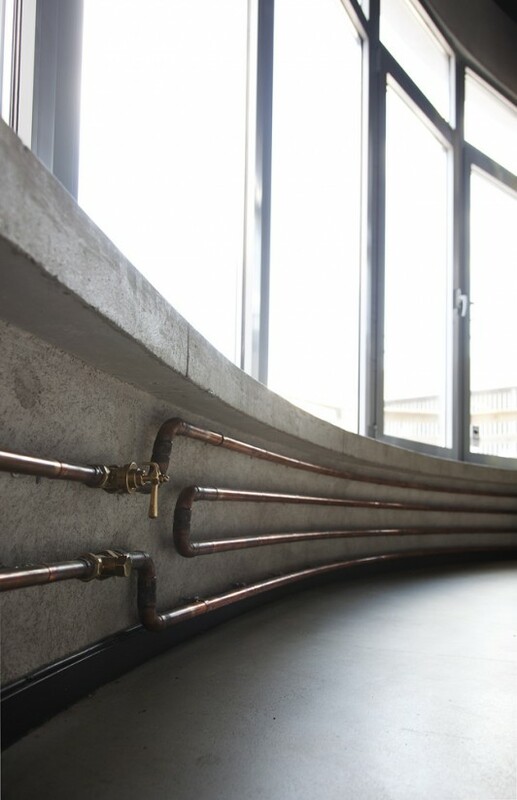 Frequently used materials include concrete, copper, steel and white tiles. 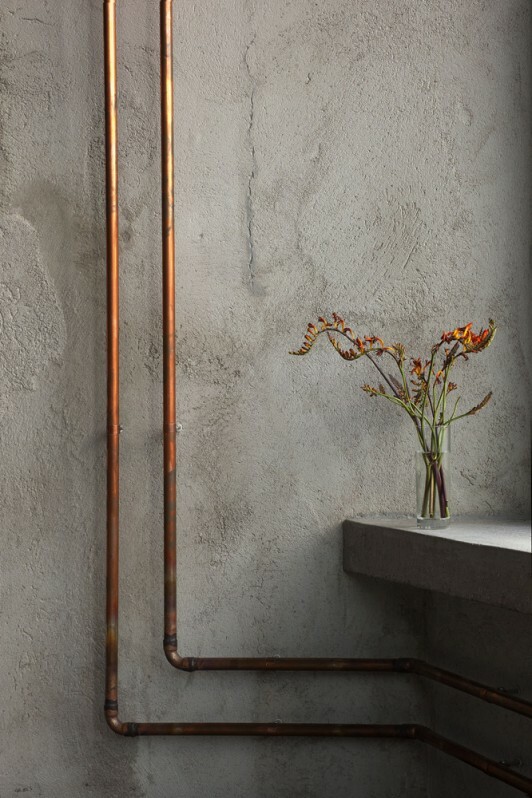 Fireplace and lighting arrangements in copper. 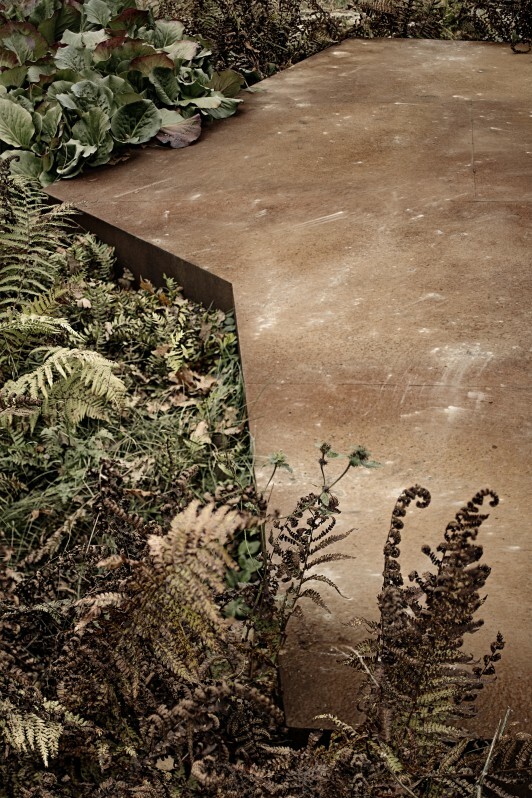 Tables made of concrete with tops in copper. 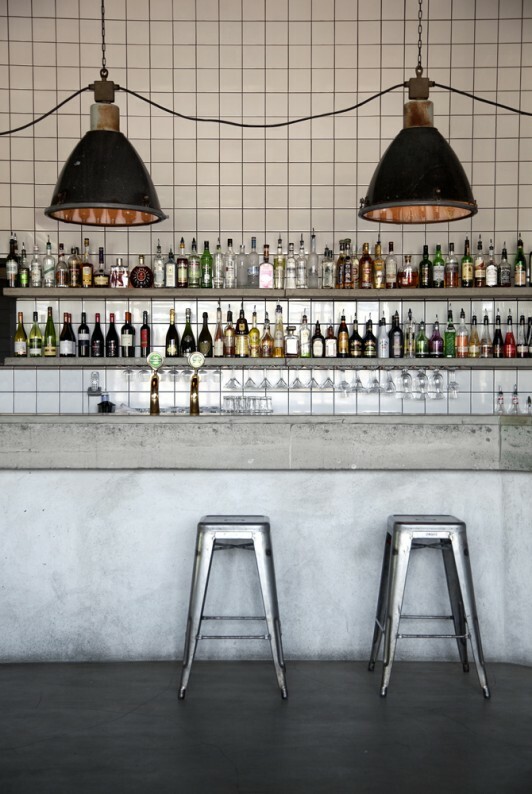 Bar in concrete. 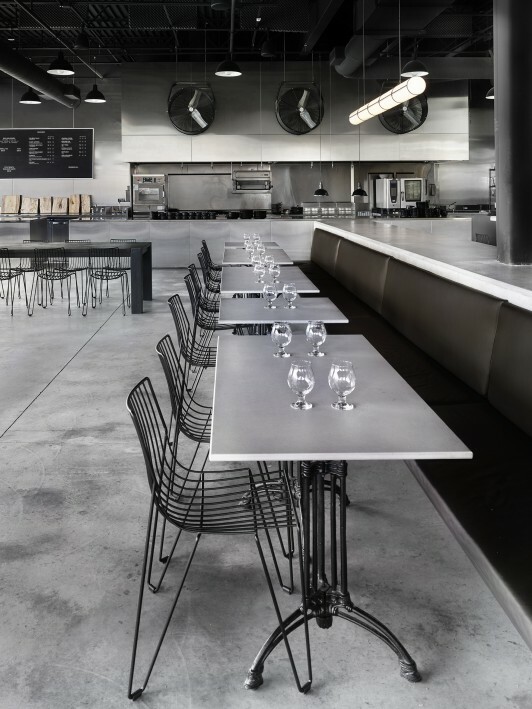 Chairs in metal from Tolix. 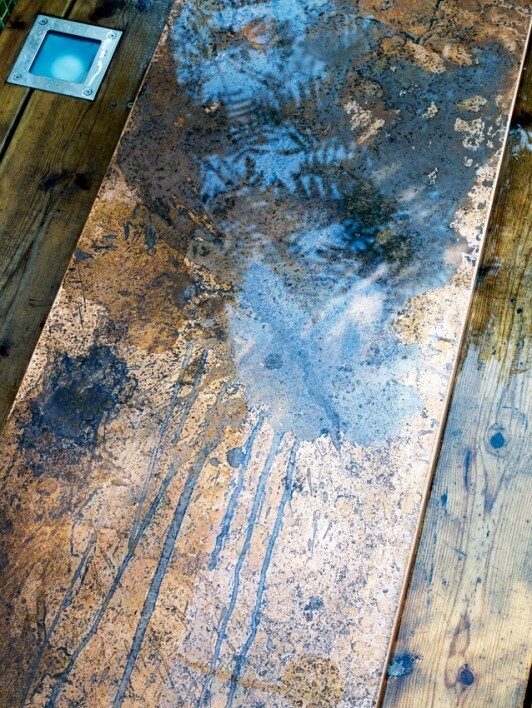 Concrete basin with details in copper. 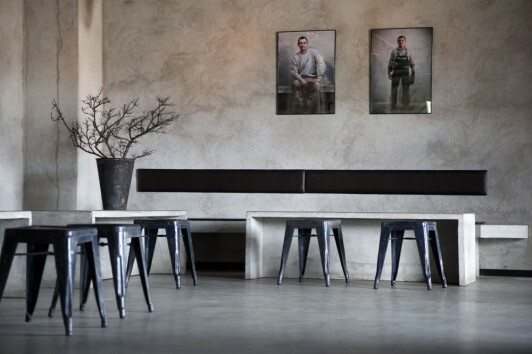 Photographs of the workers who built the restaurant. 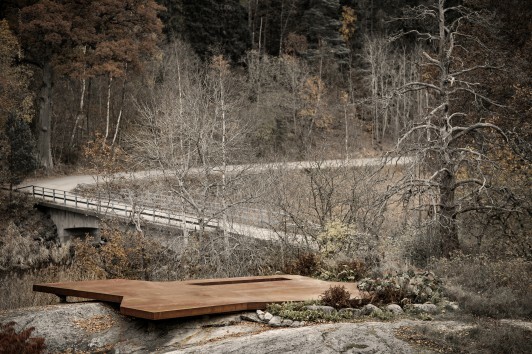 By Mattias Lindbäck. 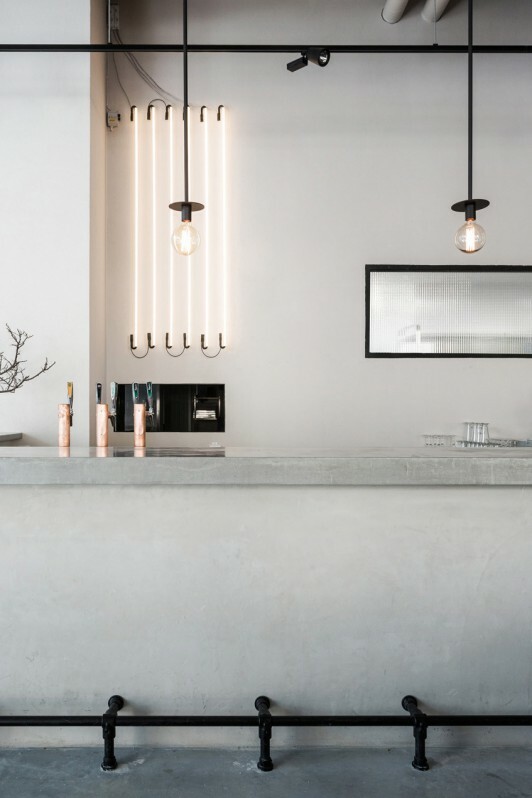 Bar and shelves made of concrete. 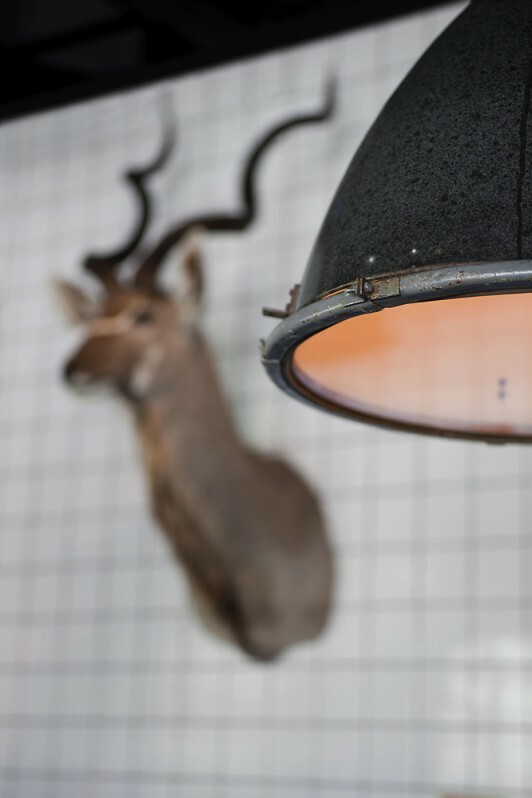 Pendant lamps taken from an old factory in the Czech Republic. 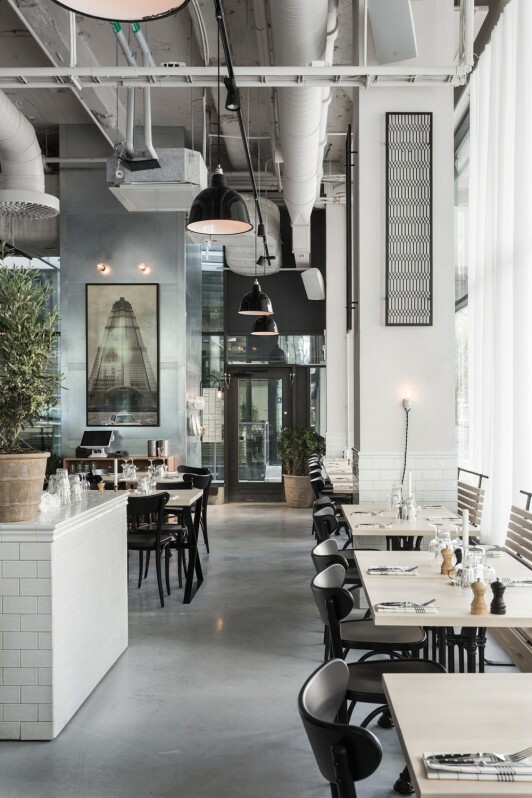 With responsibility to design the concept for a new restaurant for one of Stockholm’s famous restaurateurs, this project required creating a modern bistro that would also function as a late evening bar. 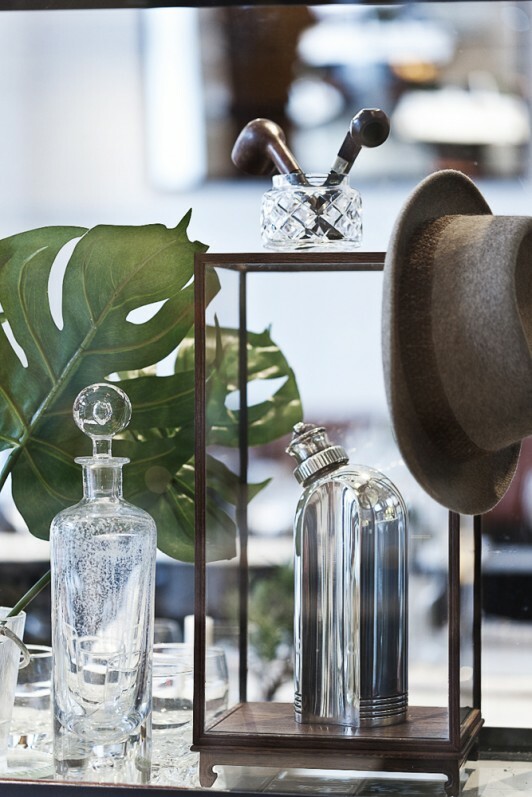 To create a vivid atmosphere, several show case stands were implemented displaying changeable content, hence the name Museet (The Museum). 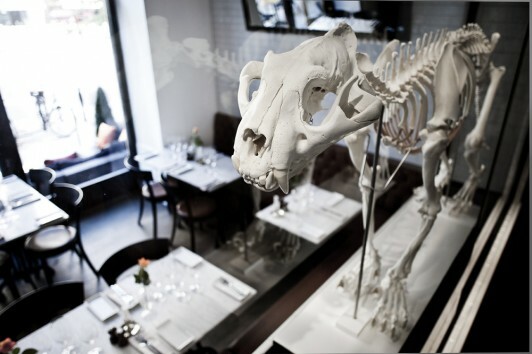 ducing the restaurants owners to WWF, their cooperation is today close with donations to save the worlds tigers. 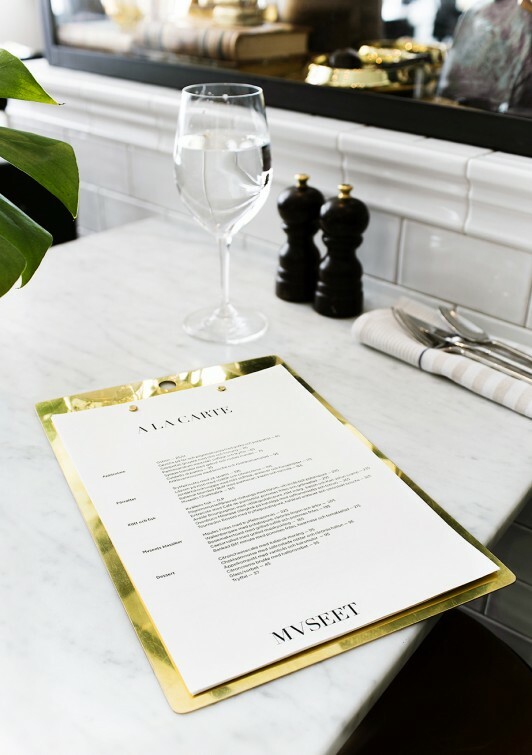 Restaurant Museet quickly became one of Stockholm’s most popular restaurants. 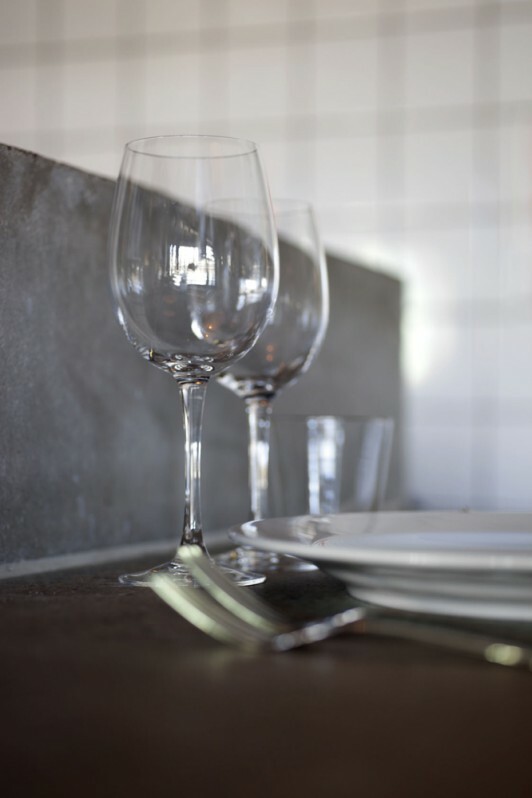 Materials are white glazed tile, dark wooden floors, marble, brass, iron, glass, flame colored velvet fabrics, cognac colored leather. Wall mounted sofas in cognac colored leather. 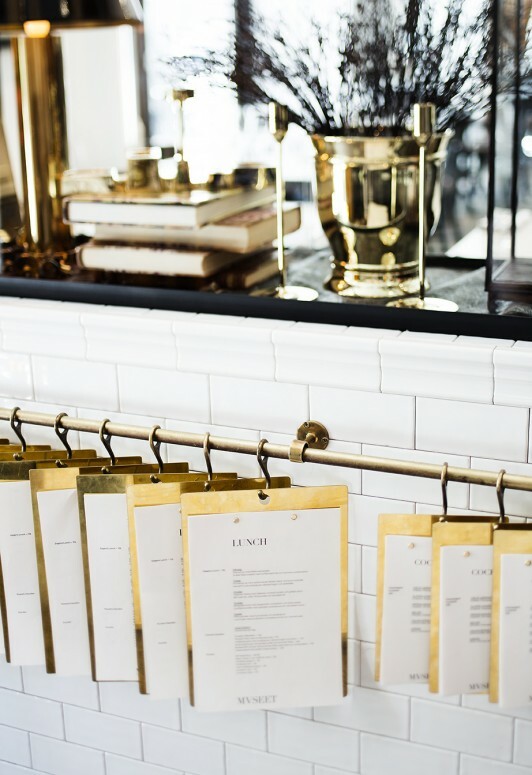 Menus in brass close up. Tiger skeleton bought from a Swedish zoo. 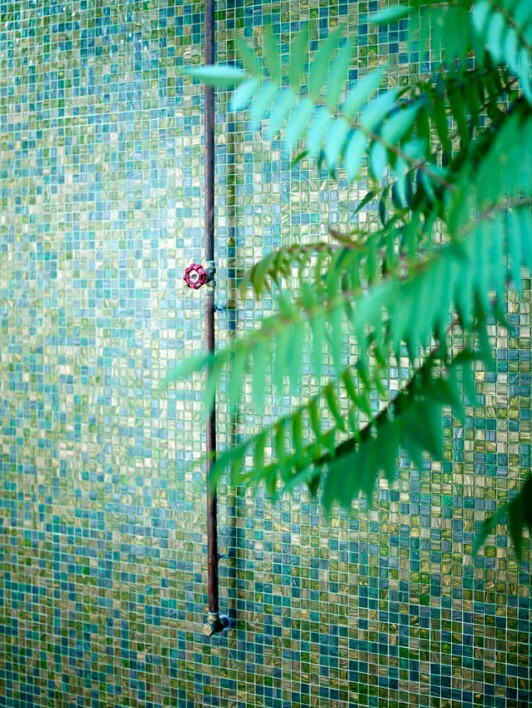 Vintage pipe in brass from an old elevator door. 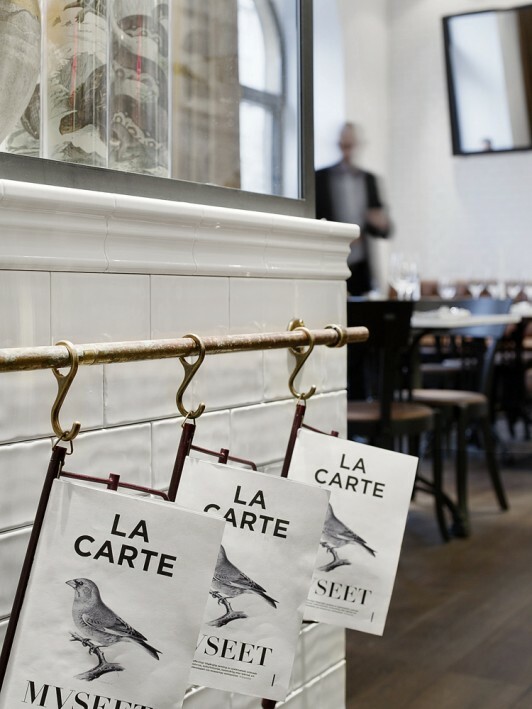 Menu holders from Hotel Sacher in Austria. 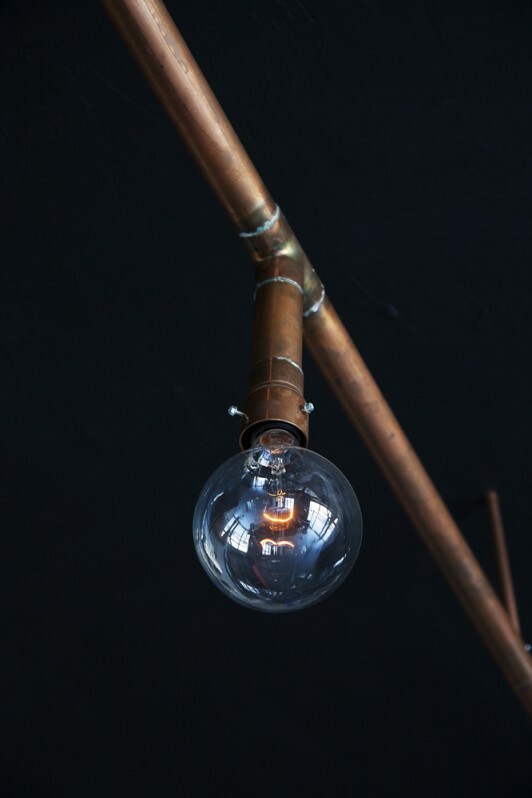 Pendant lamps from an old factory. 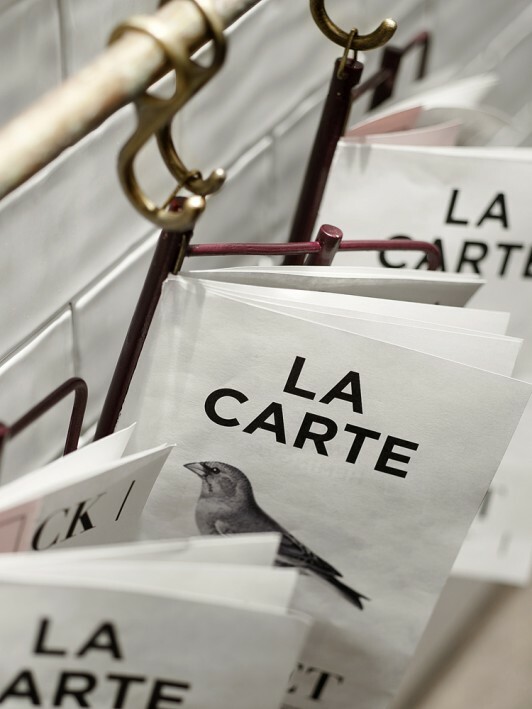 Detail from one of the show case stands. 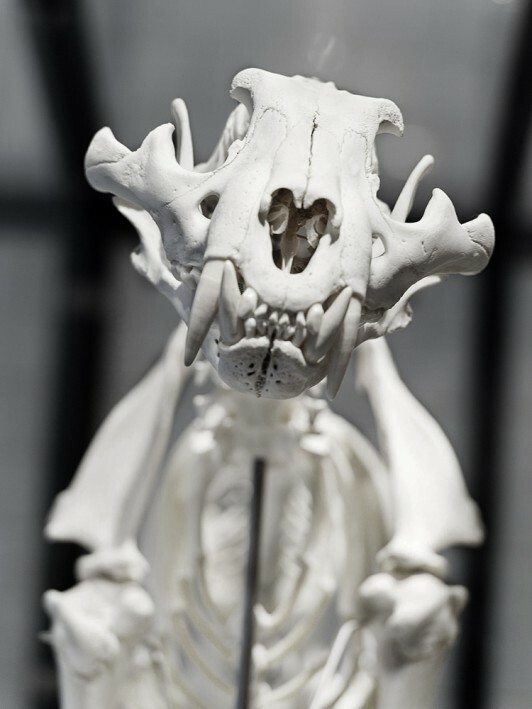 Close up of the Tiger skeleton. One of the themes in the show case stands. 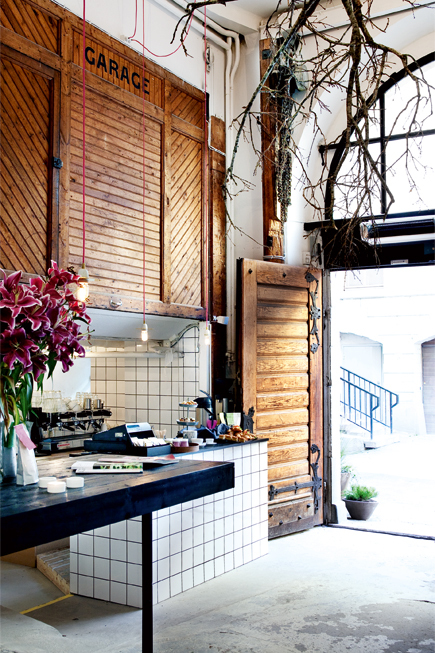 An old stable in central Stockholm was restored to be used as a space for boutiques, a gallery and café. 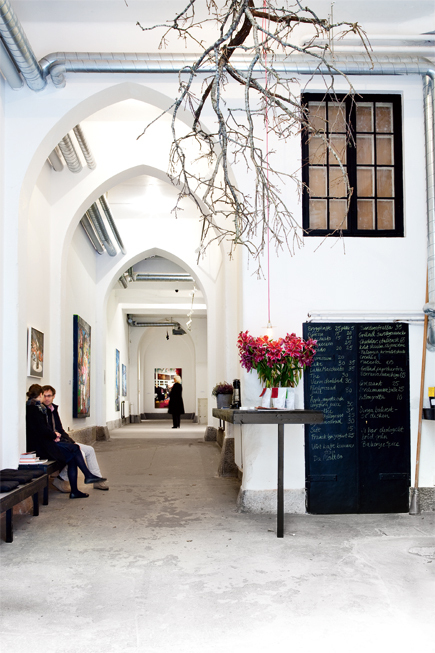 The unique features of the venue’s original details were renovated, while a large tree hangs in the entrance and the concrete floors sustain a sense of still being outside. 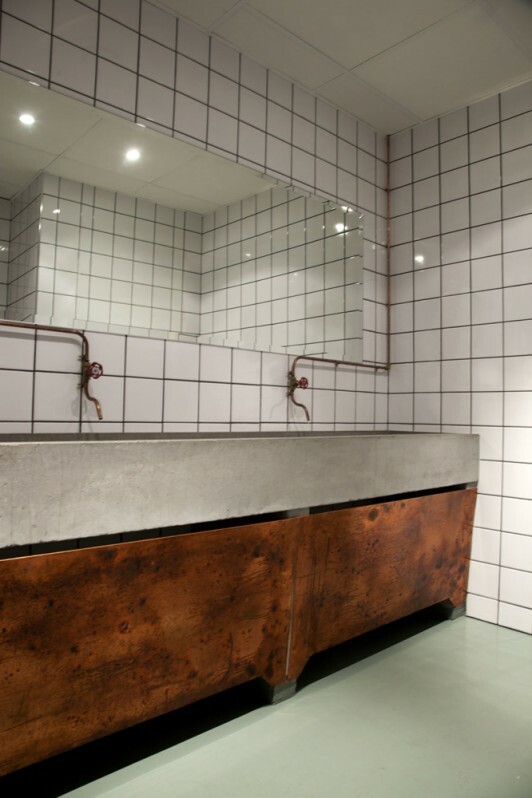 Materials used are brass, white tiles, dark wood and concrete. 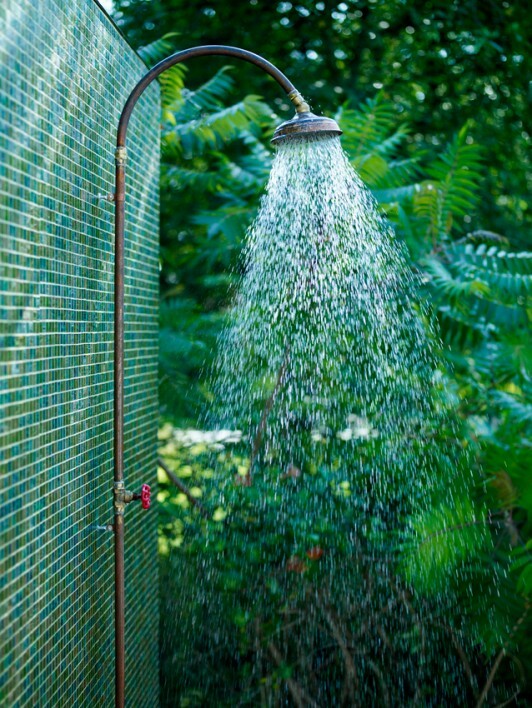 This project consisted of building an outdoor shower that would easily melt into it´s exotic non-typical Swedish surroundings. 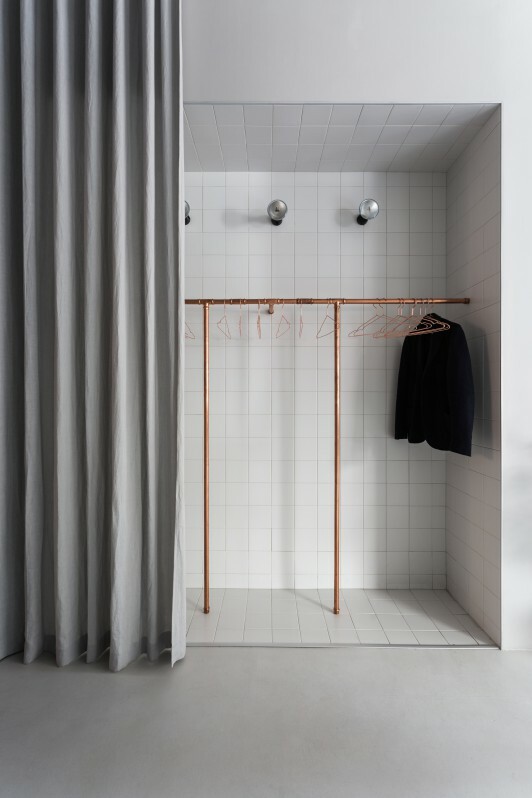 The materials used were carefully selected to match this intention – the mosaic pattern covering the shower wall (Bisazzas L’Elba), the copper shower and the copper coated base. Custom built walk in closet in a private apartment. 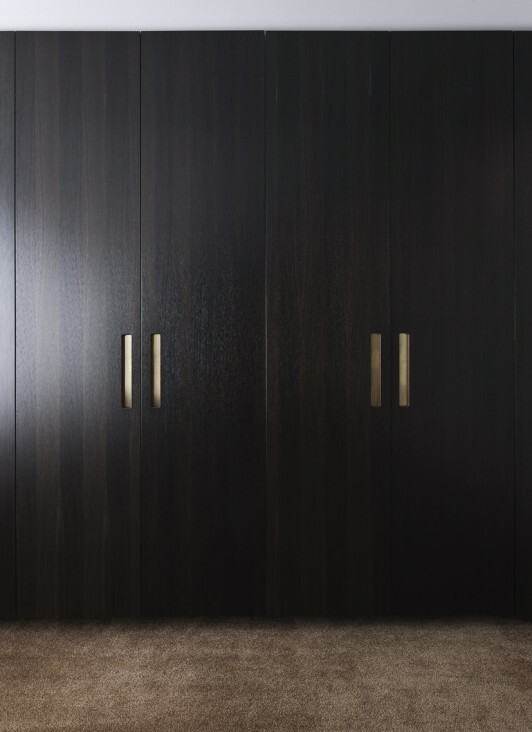 The wardrobes are made of smoked oak with handles in brass whilst the opposite wall is completely covered with mirrors. A cognac colored carpet covers the floor. 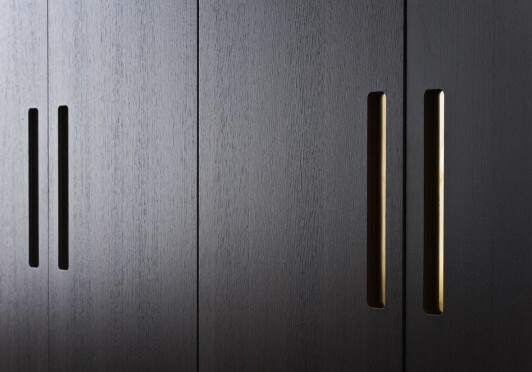 Detail of the brass handles.